Born on a sheep property I’ve grown up with wool and so it is not surprising that felting is the process I use to create my vessels. Once I was introduced to felt I was captivated by its tactile qualities, rich range of colours and the magical meshing of fibres, which then can be manipulated into forms and shapes to create vessels. Felt is a non woven cloth that is produced by matting, condensing and pressing woollen fibres. I use felt as it’s an ecological, sustainable textile. I am represented in galleries though out Australia and internationally and I exhibit my textile art and sculpture regularly in group exhibitions, art prizes and international exhibitions. I teach felt workshops regularly, including the AGNSW, Portugal and London. 2018 my sculptures are exhibited in Chateau de Gizeux, Loire Valley, France. My sculpture is a finalist in the Wangaratta Petite Miniature prize and Greenway sculpture prize and my 2D machine embroidery pieces are selected for a travelling exhibition through out Europe and Australia. 2017 I was selected as a finalist in Scythia 8th International awards, Ukraine and in 2016 won the Annandale Sculpture prize and also a finalist in Stanthorpe, Hunters Hill & and Hornsby sculpture prizes. My sculptures were selected in the Harbour Sculpture prize 2015/2017 and the same years I won “Textures of One” prizes. In 2016 my sculpture received highly commended in the Buda Contemporary Textile Prize, Castlemaine, Vic and my artwork received highly commended at Art Unlimited, Dunedoon NSW. 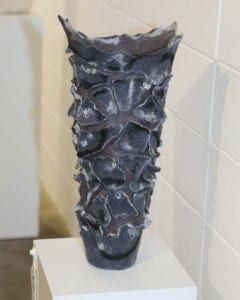 I recently had a solo exhibition at the Muswellbrook Regional Art Centre and The Design Gallery, Terrigal . 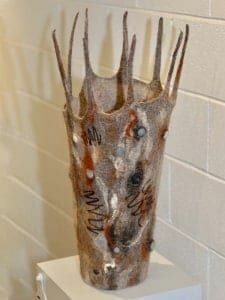 My 2-D art piece and felt sculptures were selected for the Biennial “World of Threads Festival” in Canada 2012/2014. 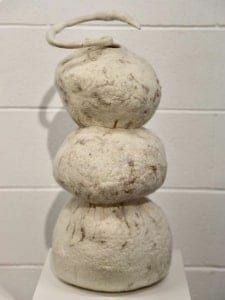 In 2014 I won the Hornsby Sculptural Art Prize and 2015 received the judges highly commended and I was a finalist in the Broken Hill Outback Art Prize 2012/2013 with my 2-D felt works and the Hunters Hill Art Prize regularly. “The Link” sculpture has been published in the “Worldwide Colours of Felt” book, Netherlands and my work is included in the Dimensional Cloth, Sculpture by Contemporary Textile Artists book by Andra Stanton USA, 2018.